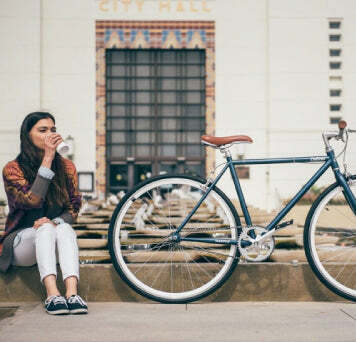 Harper Coaster is the perfect bike for the rider who wants the sleek profile of a fixed-gear with the refreshing ease of a cruiser. The really special thing about Harper Coaster is that it has a built-in coaster brake. No more cables, no more wires, no more clunky. Why is the Harper Coaster ultimately a better choice than a beach cruiser? Harper’s 700c wheels are larger than the beach cruiser’s 26” wheels, which means you can cover more ground and ride faster. The sleek frame and wheels are also lighter than a typical beach cruiser. We guarantee our hand-built, tig-welded, high-tensile strength steel frame for life. Ride with bar-spin clearance, a flat top tube, no toe overlap, and horizontal dropouts, perfect for the commuter’s lifestyle. The coaster brake is the most straightforward brake to control. Simply pedal backwards to come to a stop. There are no levers or cables to deal with. This ultra sleek silhouette doesn’t require significant upkeep because there are so few elements to it. Harper Coaster single-speed is also equipped with riser handlebars. Sit upright and relaxed while you ride. You’ll be more comfortable in this position while you ride. VP freestyle pedals and KMC chains are always reliable while the 30mm deep-V rims and thick Wanda tires facilitate an extra smooth ride. Tools: All the tools you need to build and maintain your own bicycle inclucding three metric Allen wrenches and a flat wrench.